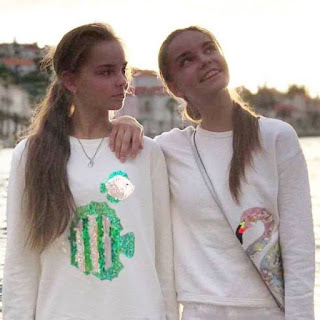 Here you can find everything about your favorite russian gymnasts twins. If you are NOT going to read the post in English, be careful of GoogleTranslator's translations. Sometimes it does not work properly and translate things wrong. A) You have to send an email to our gmail account with your full name and the link to the music you need (of Dina and Arina, of course). B) Write on YT a comment on the video saying "how can I get this music? ", and we will reply to you as soon as we read for you to send us an email to our gmail account with the name and surname. To know: you must send us an email, thus, your identity will be protected and no one can seize your account. - Ball: Kerry Muzzey "Architect of the mind"
- Clubs: Il barbiere di seviglia "Largo al factotum"
- Ball: Simona Molinari, Peter Concoti "La Felicità"
- Hoop: Andrei Petrov - "The Subdual of the fire (overture)"
- Clubs: Opus - "Life is life"
- Ribbon: Roby Lakatos "Csardas"
Khava Nagila -"Yevreyskaya narodnaya pesnya" /Stanley Black: London Festival Orchestra & Chorus – "Hava Nagila"
- Hoop: Santana - "Soul Sacrifice"
-Clubs: Marina Devyatova - "Akh Vy Seni Moi Seni"
-Ribbon: London Symphony Orchestra - "Paquita: Pas De Deux"
Degg & Blakker - "Tango 2000 (Kut and swel tribal remix)"
JJ Vianello, Tito Nieves, Enzo Diaz - "Volare", "Bang Bang", "Quien como tu"
Ricky Martin - "Livin' la vida loca"
DJ Valer Orchestra - "Rio Rita"
Joseph Francek & Wiener Strauss-Orchester - "Tritsch-Trarsch-Polka Op.214"
k7 - "Hi de Ho"
Jor Tupetzkogo & A. Stotzkaya - "Letka-enka"
- Clubs: Royal Crown Revue "Hey Pachuco!" -Ribbon: Yo-Yo Ma "I. Allegro"
- Ball: DJ Bobo "Volare"
- Hoop: Smolensk Symphonic Orchestra - "Swan Lake (Act II N1)"
- Clubs: Kuban Cossack Choir "Unharness the horses, lads"
-Ribbon: Boris Asafiev "Flames of Paris"
- Ball: Eduard Hill - "Zima"
- Clubs: Antonella Ruggiero - "Caravan"
- Ribbon: Moiseyev Dance Ensemble - "Tsigany"
Pierre Boulet y Orquesta Sinfónica de Chicago - "Stravinksy: El Firebird - Ballet - danza infernal"
Alsou - "Canción por osos"
Aram Khachaturian - "Sabre Dance"
Valeri Syutkin - "Korol 'Oranzhevoe Leto"
Vladimir Kuz'min - "Koroleva Krasoti"
Cherry Poppin 'Daddies - "El papá ding-dong de la línea d-coche"
Averina Twins Official 1st Club. Simple theme. Powered by Blogger.